Here are 4 life-changing reasons for High School Financial Literacy Course. Homeschool high schoolers are often busy earning high-powered credits that will upgrade their transcripts for college admissions OR busy with apprenticeships if they are headed straight for careers. It is easy to overlook one of the most important courses for ALL teens: Financial Literacy. 1) CREDIT CARDS: Once a teen applies to a college, he/she will be inundated with credit card application forms. A teen without financial literacy instruction may be sucked in to getting a credit card and using it, without realizing the problems that can result and take, often, YEARS to correct. 2) PLANNING TO FAIL? : The old adage, “If you fail to plan, you plan to fail” applies in much of life, including financial goals. A financial literacy course provides the guidance on how to determine individual financial goals and how to plan in order to make those goals an eventual reality. 3) WISE INSURANCE CHOICES: A young adult who is filling out his/her enrollment for employee benefits for the first time and who hasn’t had a background in financial literacy might not realize the importance of some of the insurance coverages often offered, such as short and long term liability insurance. 4) WASTED MONEY: Young adults with ‘simple’ financial lives may unnecessarily pay a tax preparer to complete their tax returns, not realizing that with the tax instruction booklet (and maybe a couple of quick information searches on the internet), they could easily complete the return themselves and save a significant amount of money. 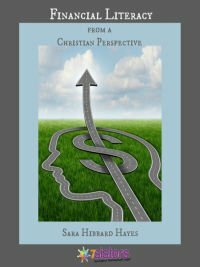 Download Financial Literacy from a Christian Perspective for your homeschool high schoolers. This interactive course leads teens through a true learning experience with internet assignments and exploration PLUS real-life preparation and planning.